How to recover photos from iCloud? 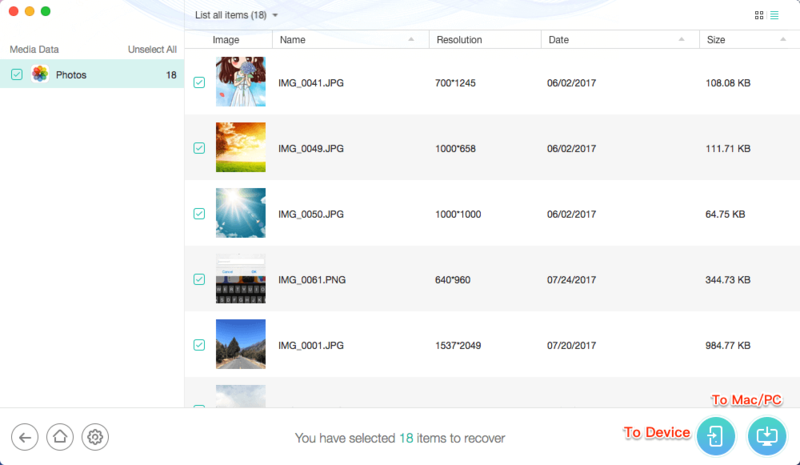 Read the post to get 4 reliable ways to recover photos from iCloud to your iPhone/iPad/iPod touch, or to Mac or PC computer. Download PhoneRescue for iOS to access & view iCloud photos and retrieve them from backup to iDevice/Mac/PC without restoring your device. How to retrieve photos from iCloud? In general, you can restore photos from iCloud by visiting iCloud online to export the photos as long as you’ve enabled iCloud Photo Library on iPhone/iPad/iPod touch, or export photos from iCloud drive if you had saved photos to it, or restore the iCloud backup that contains the photos you need. Here in this post, to help you recover photos from iCloud, we will show you the detailed steps of these 4 methods respectively. Let’s check. 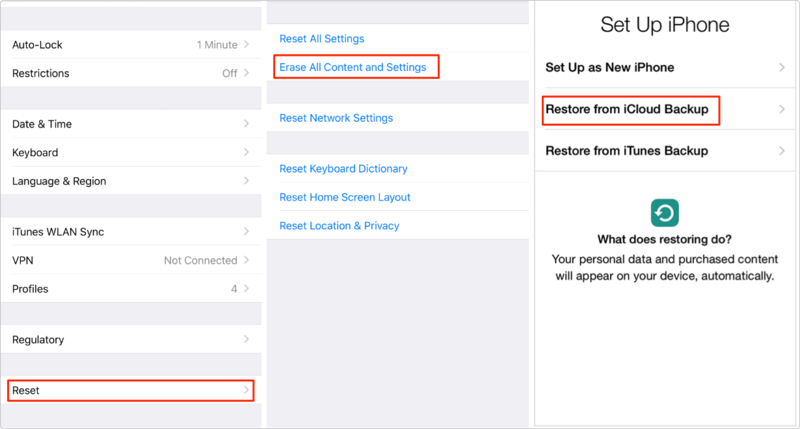 On your iPhone or iPad, tap on Settings > General > Reset > Erase All Content and Settings > Erase iPhone/iPad/iPod > Select Restore from iCloud > Pick up the iCloud backup that contains the photos you want to retrieve. In most cases, recovering photos from iCloud means to recover photos from iCloud backup. This is the traditional method that Apple offers you to recover lost or deleted photos. However, this method has two serious shortcomings, one is that it will wipe all existing data and settings on your iPhone iPad because you need to restore your iDevice, the other one is that it’s inflexible restoring that you have to restore the entire backup and can not view the backup details. Supports recovering photos from iCloud backup without restoring and erasing. That is to say you don’t need to restore your iDevice, and all your current data won’t be replaced by backup files. Enables you to view backup details, you can preview the photos in iCloud backup and choose the photos you prefer most to recover. It’s more flexible. Offers you more choices. You can retrieve photos from iCloud to the Photos app on your iPhone iPad directly , or save them to your computer (PC/Mac). Besides photos, it also supports recovering messages, videos, contacts, notes, calendar as well as other files from iCloud backup. Supports downloading the whole iCloud backup to Mac/PC computer, so that you can view and manage the iCloud content locally. Besides restoring photos from iCloud, it also supports restoring from iTunes backup. More than anything, if the iCloud and iTunes backup doesn’t contains the photos you want to recover, you can use it to recover photos from iPhone directly. Please ensure that you have backed up your iPhone to iCloud by checking on your iPhone with steps below: Settings > iCloud > Storage & Backup > Manage Storage > Device Name > Check the date of the backup created. 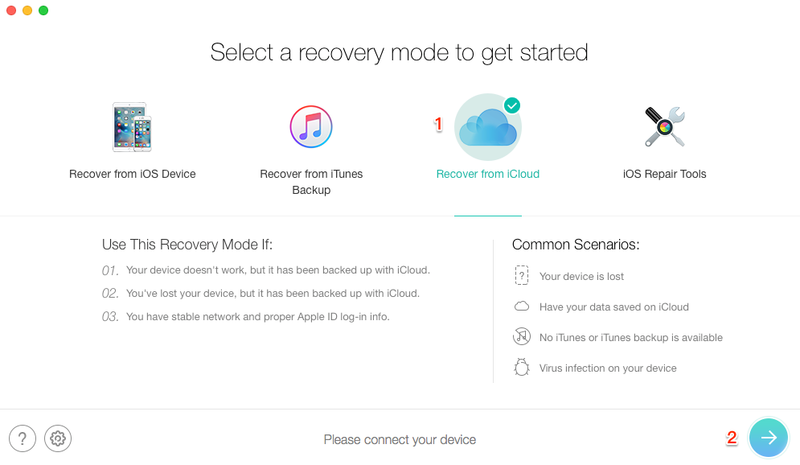 With PhoneRescue for iOS, you just need 4 steps to recover photos from iCloud backup to iPhone. Step 1. Go to the Download Page of PhoneRescue, choose Download for iOS to download it on your computer > Run it > Choose Recover from iCloud mode > Click Next to login your iCloud account. If you want to recover photos to your iPhone directly, just connect your device to the computer. Step 2. Select iCloud Backup. Step 3. Select one iCloud backup > Click Download. Then it would pop up a screen to enable you choose the exact data you would like to recover > Check Photos only and click OK button to download the backup. 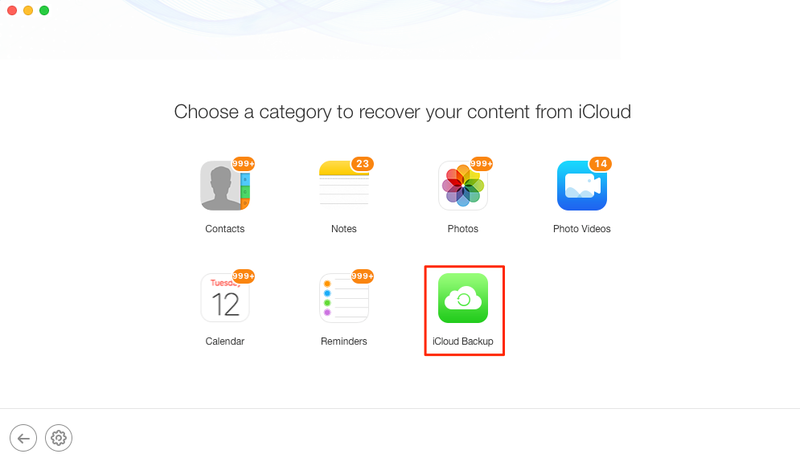 After the process is completed, select one iCloud backup and click Next to analyze/access content in it. Step 4. Select Photos on the left side > Choose the photos you want to retrieve > Click To Device button to get them back to iPhone’s Photos App directly, or click To Computer button to recover them to PC/Mac computer. 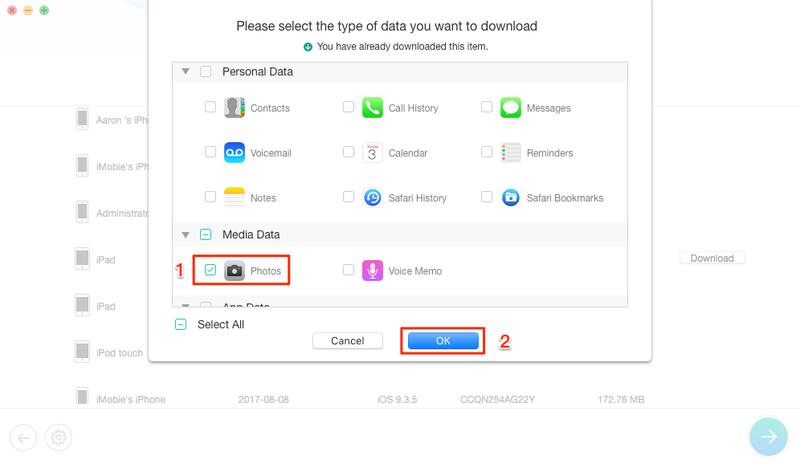 Generally, when you deleted the photos from iPhone iPad with iCloud Photo Library on, photos will also be removed from iCloud online because of the auto sync feature. But, some iOS users upload photos to iCloud for preservation without turn on the iCloud Photo Library on device. This makes it possible to recover photos from iCloud online. To recover photos from iCloud online, you can just go to iCloud.com and sign in with your Apple ID > Click Photos icon, then preview and select the photos you want to recover > Click the Download icon at the top. This method only works for people saved photos on iCloud without turning on iCloud Photo Library sync feature on Device. You have to select photos one by one to download them to your computer, if you want to save time, you can download all photos from iCloud at once. Step 1. Go to iCloud.com and sign in with your Apple ID. Step 2. Click iCloud Drive. Step 3. Select the photos you need and click the Download icon at the top. That’s all about how to retrieve photos from iCloud. Besides recovering iCloud photos, if there are some important photos in iTunes backup, you can also use PhoneRescue for iOS to extract them. And actually, you can extract more than photos from iTunes or iCloud. Obviously, nobody wants to lose photo, the best way to prevent photo loss is making backup of your iPhone iPad regularly. If you lose photos by accident, no matter you have backup or not, you can download PhoneRescue for iOS to get your lost photos back!